Although protected under the bony ribcage, the spleen remains the most commonly affected organ in blunt injury to the abdomen in all age groups. While some references occasionally document liver injuries as being more common, blunt injuries to the spleen are documented more frequently as the primary solid organ injury in the abdomen. These injuries are common in both rural and urban environments and result from motor vehicle crashes, domestic violence, sporting events, and accidents involving bicycle handlebars. See the images below. Intra-parenchymal blush observed on helical CT scan. A general surgeon in a community hospital is just as likely to observe and treat a splenic injury as the full-time trauma surgeon in an American College of Surgeons (ACS) –verified Level 1 or Level 2 trauma center. For this reason, all physicians involved in emergency care, especially surgeons, whether rural or urban, must keep up-to-date on issues regarding splenic injury diagnosis, splenic salvage techniques, indications for nonoperative treatment, and potential complications arising from both operative splenectomy and nonoperative management of this important organ. In 1893, Reigner published the first documented successful splenectomy in the German literature. Operative mortality rates remained high until the 1950s, when new and rapid advancements in surgical and anesthesia sciences occurred. Nonoperative care during this period was predominantly fatal. Prior to the advent of CT scanning, physical examination and diagnostic procedures such as diagnostic peritoneal lavage (DPL) and radioisotope scans were the only diagnostic methods. Minor splenic injury was probably frequently missed, while major injury prompting laparotomy for hypotension or physical findings was the norm. The spleen, weighing 75-150 g, is a highly vascular organ that filters an estimated 10-15% of total blood volume every minute. The spleen may hold 40-50 mL of red cells in reserve on average; however, with changes in internal smooth muscle, it can pool significantly more blood. Historically, many early shock studies performed in canine models were invalidated when it was discovered that dogs could autotransfuse stored red cells from their spleen with smooth muscle contraction. Humans do not have this ability. As much as 25% of the circulating platelets are estimated to be held in reserve in the spleen. Although protected anatomically under the rib cage in the left upper quadrant of the abdomen, it is frequently injured by blunt external trauma. It can also be iatrogenically injured in emergency operations, especially when preexisting adhesions make mobilization of intra-abdominal structures difficult. Because of the immunologic function of the spleen, interest over the last century has turned to salvage of the spleen rather than splenectomy. The advent of CT scanning has made conservative management more practical and safer for victims of splenic injury. CT scanning has facilitated safe, nonoperative management in young and old patients to an unprecedented degree, but deaths due to splenic rupture are still reported in hospital discharge statistics from both Level 1 trauma centers and community hospitals. A thorough knowledge of splenic function, anatomy, and pathophysiology is necessary to continue the progress of the last decade and to decrease the mortality rate from this common injury in the United States and worldwide. Determining the actual frequency of splenic injuries with precision in the United States or worldwide is not possible. Hospital discharge data may not document the injury if there are numerous, more serious injuries or diseases. A general consensus of trauma admissions at Level 1 trauma centers across the country suggests splenic injury occurs in as many as 25% of the average 800-1200 admissions for blunt trauma per year. This is a select population of patients with multiple injuries and does not take into account isolated splenic injuries observed and treated at nontrauma centers. Splenic injury is most often observed in blunt trauma. While penetrating trauma (eg, gun shot wounds, knife wounds) may involve the spleen, the incidence of injury is well below that of the small and large intestine. A third mechanism that combines aspects of blunt and penetrating trauma occurs with explosive type injuries, as seen in warfare and civilian bombing. Although the spleen is relatively protected under the ribcage, injury due to rapid deceleration, such as occurs in motor vehicle crashes, direct blows to the abdomen in domestic violence, or leisure and play activities such as bicycling, frequently result in a variety of splenic injuries. In addition, over half of (56.1%) affected patients underwent laparotomy and splenectomy, with the most common finds of splenic hematoma (47%), laceration (47%), and rupture (33.3%). Ha and Minchin concluded that recognition of postcolonoscopy splenic injury as an important complication will not only rise, but it will be necessary given the increasing numbers of colonoscopies being performed for colorectal diseases and the possibility of delayed diagnosis resulting in adverse outcomes. Though normally protected by its anatomic position, preexisting illness or disease can markedly increase the risks and severity of splenic injury. Infectious mononucleosis, malaria, and hematologic abnormalities can lead to acute or chronic enlargement of the spleen. This is often accompanied by a thinning of the capsule, making the spleen more fragile as well as engendering a greater mass effect in decelerating trauma. Minor impact in patients with splenomegaly reportedly results in major injury and the need for splenectomy. The clinical presentation of splenic injury is highly variable. Most patients with minor focal injury to the spleen complain of left upper quadrant abdominal tenderness. Left shoulder tenderness may also be present as a result of subdiaphragmatic nerve root irritation with referred pain. With free intraperitoneal blood, diffuse abdominal pain, peritoneal irritation, and rebound tenderness are more likely. If the intra-abdominal bleeding exceeds 5-10% of blood volume, clinical signs of early shock may manifest. Signs include tachycardia, tachypnea, restlessness, and anxiety. Patients may have a mild pallor noted only by friends and family. Clinical signs include decreased capillary refill and decreased pulse pressure. With increasing blood loss into the abdominal cavity, abdominal distension, peritoneal signs, and overt shock may be observed. Hypotension in a patient with a suspected splenic injury, especially if young and previously healthy, is a grave sign and a surgical emergency. This should prompt immediate evaluation and intervention either in the OR or interventional radiology if a state of compensated shock can be maintained. Unstable patients have nearly exsanguinated in CT scanners while in the process of documenting splenic injury, when they would have been better served by exploration in the operating room or embolization in the IR suite. In simple terms, unstable patients suspected of splenic injury and intra-abdominal hemorrhage should undergo exploratory laparotomy and splenic repair or removal. A blunt trauma patient with evidence of hemodynamic instability unresponsive to fluid challenge with no other signs of external hemorrhage should be considered to have a life-threatening solid organ (splenic) injury until proven otherwise. Transient responders, those patients who respond to an initial fluid bolus only to deteriorate again with a drop in blood pressure and increasing tachycardia, are also likely to have solid organ injury with ongoing hemorrhage. Patients with compensated shock may be managed by angioembolization but only if these services can be performed in a timely manner equivalent to that of operative intervention. In the stable trauma patient, commonly defined as a patient with systolic blood pressure greater than 90 mm Hg with a heart rate less than 120 beats per minute (bpm), CT scanning provides the most ideal noninvasive means for evaluating the spleen. Helical or spiral scanners may provide even more information and may clarify the degree of injury. In the cases of CT scan–documented splenic injury, the decision for operative intervention is determined by the grade of the injury, the patient's current and preexisting medical conditions, and the facilities available at the hospital, including the intensive care unit and the availability of operating and anesthesia services. The major determining factors in operative intervention in the stable patient with a splenic injury include grade of injury (American Association for the Surgery of Trauma [AAST] scale), presence of intraperitoneal blood, presence of a blush on CT scan, calculated risk of rebleeding, presence and severity of concomitant injuries, and options regarding blood transfusion. Signs of persistent bleeding and hemodynamic instability unresponsive to fluid and blood administration are clear indications for surgery. The decision for operative intervention in other cases requires the thoughtful consideration of the surgeon. Angioembolization, once contraindicated in compensated shock, has now been reported as a safe method of splenic salvage when immediately available in the treating facility. A healthy 25-year-old patient who has a CT scan grade 4 laceration with stable vital signs and minimal fluid requirements may be safe to observe under controlled conditions, while a 55-year-old patient who is a Jehovah's Witness and who has a CT scan grade 2 oozing splenic injury and pelvic fracture would probably benefit more from early surgical intervention. The spleen sits in the left upper quadrant of the abdomen under the diaphragm and lateral to the stomach. Left shoulder pain, also known as the Kehr sign, results when blood from an injured spleen irritates the diaphragm and creates referred pain. The spleen is completely encircled and covered with peritoneum except for the insertion of the splenic artery and vein. This capsule around the spleen, especially the thicker layer in young patients, provides added protection against blunt injury. The spleen is primarily fixated to the posterior aspect of the left upper quadrant by gastrosplenic and splenorenal ligaments. The size and thickness of these ligaments vary greatly, with some spleens appearing to be very mobile, while others appear fixed in the left upper quadrant. The major arterial supply to the spleen is through the splenic artery, which branches off the celiac artery and runs superior and posterior to the pancreas. The artery commonly bifurcates externally to the spleen, supplying upper and lower poles separately, a finding that may make splenorrhaphy much easier for the operating surgeon. The splenic vein courses with the artery but empties into the superior mesenteric vein and then into the portal vein. The arterial supply and venous drainage of the spleen is augmented by the short gastric vessels that branch from the left gastroepiploic artery. These vessels may be as short as 1 mm, thus creating a challenge during emergency operative intervention. Notably, the splenic artery and vein may have small branches feeding the body and tail of the pancreas, so care should be taken in dissecting these vessels away from the splenic hilum. The tail of the pancreas is often intimately positioned near the splenic hilum and can be easily damaged during splenectomy if adequate care is not taken to identify and protect the organ. No contraindications to operative intervention exist in a hemodynamically unstable patient with a splenic injury. However, hypotension or unstable vital signs are a contraindication to CT scanning, and deaths due to splenic rupture and ongoing bleeding have occurred in the radiology suite while trying to document a splenic injury. Unstable patients can be assessed by FAST or DPL in addition to clinical examination but should not undergo CT scanning of the abdomen for diagnosis. Harbrecht BG, Franklin GA, Miller FB, Richardson JD. Is splenectomy after trauma an endangered species?. Am Surg. 2008 May. 74(5):410-2. [Medline]. Fishback SJ, Pickhardt PJ, Bhalla S, Menias CO, Congdon RG, Macari M. Delayed presentation of splenic rupture following colonoscopy: clinical and CT findings. Emerg Radiol. 2011 Dec. 18(6):539-44. [Medline]. Ha JF, Minchin D. Splenic injury in colonoscopy: a review. Int J Surg. 2009 Jul 26. epub ahead of print. [Medline]. Rozycki GS, Knudson MM, Shackford SR. Surgeon-performed bedside organ assessment with sonography after trauma (BOAST): a pilot study from the WTA Multicenter Group. J Trauma. 2005 Dec. 59(6):1356-64. Sirlin CB, Casola G, Brown MA. Patterns of fluid accumulation on screening ultrasonography for blunt abdominal trauma: comparison with site of injury. J Ultrasound Med. 2001 Apr. 20(4):351-7. Hedrick TL, Sawyer RG, Young JS. MRI for the diagnosis of blunt abdominal trauma: a case report. Emerg Radiol. 2005 Jul. 11(5):309-11. Lin WC, Chen YF, Lin CH, Tzeng YH, Chiang HJ, Ho YJ. Emergent transcatheter arterial embolization in hemodynamically unstable patients with blunt splenic injury. Acad Radiol. 2008 Feb. 15(2):201-8. [Medline]. Willmann JK, Roos JE, Platz A. Multidetector CT: detection of active hemorrhage in patients with blunt abdominal trauma. AJR Am J Roentgenol. 2002 Aug. 179(2):437-44. [Medline]. Nwomeh BC, Nadler EP, Meza MP. Contrast extravasation predicts the need for operative intervention in children with blunt splenic trauma. J Trauma. 2004 Mar. 56(3):537-41. Marmery H, Shanmuganathan K, Mirvis SE, Richard H 3rd, Sliker C, Miller LA, et al. Correlation of multidetector CT findings with splenic arteriography and surgery: prospective study in 392 patients. J Am Coll Surg. 2008 Apr. 206(4):685-93. [Medline]. Vick LR, Islam S. Recombinant factor VIIa as an adjunct in nonoperative management of solid organ injuries in children. J Pediatr Surg. 2008 Jan. 43(1):195-8; discussion 198-9. [Medline]. Sims CA, Wiebe DJ, Nance ML. Blunt solid organ injury: do adult and pediatric surgeons treat children differently?. J Trauma. 2008 Sep. 65(3):698-703. [Medline]. Wu Y, Wan L, Li P, Zhang Y, Li M, Gong J, et al. Application of radiofrequency ablation for splenic preservation. J Surg Res. 2014 Jul 22. [Medline]. Shatz DV, Schinsky MF, Pais LB, et al. Immune responses of splenectomized trauma patients to the 23-valent pneumococcal polysaccharide vaccine at 1 versus 7 versus 14 days after splenectomy. J Trauma. 1998 May. 44(5):760-5; discussion 765-6. [Medline]. Shatz DV, Romero-Steiner S, Elie CM, Holder PF, Carlone GM. Antibody responses in postsplenectomy trauma patients receiving the 23-valent pneumococcal polysaccharide vaccine at 14 versus 28 days postoperatively. J Trauma. 2002 Dec. 53(6):1037-42. [Medline]. Killeen KL, Shanmuganathan K, Boyd-Kranis R. CT findings after embolization for blunt splenic trauma. J Vasc Interv Radiol. 2001 Feb. 12(2):209-14. [Medline]. Ekeh AP, McCarthy MC, Woods RJ. Complications arising from splenic embolization after blunt splenic trauma. Am J Surg. 2005 Mar. 189(3):335-9. Wu HM, Kortbeek JB. Management of splenic pseudocysts following trauma: a retrospective case series. Am J Surg. 2006 May. 191(5):631-4. Runyan BL, Smith RS, Osland JS. Progressive splenomegaly following splenic artery embolization. Am Surg. 2008 May. 74(5):437-9. [Medline]. Hamers RL, Van Den Berg FG, Groeneveld AB. Acute necrotizing pancreatitis following inadvertent extensive splenic artery embolisation for trauma. Br J Radiol. 2009 Jan. 82(973):e11-4. [Medline]. Bjerke S, Pohlman T, Saywell RM. Evolution, not revolution: splenic salvage for blunt trauma in a statewide voluntary trauma system--a 10-year experience. Am J Surg. 2006 Mar. 191(3):413-7. Harbrecht BG, Zenati MS, Ochoa JB. Management of adult blunt splenic injuries: comparison between level I and level II trauma centers. J Am Coll Surg. 2004 Feb. 198(2):232-9. Carlin AM, Tyburski JG, Wilson RF. Factors affecting the outcome of patients with splenic trauma. Am Surg. 2002 Mar. 68(3):232-9. Amonkar SJ, Kumar EN. Spontaneous rupture of the spleen: three case reports and causative processes for the radiologist to consider. Br J Radiol. 2009 Jun. 82(978):e111-3. [Medline]. Bain IM, Kirby RM. 10 year experience of splenic injury: an increasing place for conservative management after blunt trauma. Injury. 1998 Apr. 29(3):177-82. [Medline]. Bain IM, Kirby RM, Cook AL. Role of the general surgeon in a British trauma centre. Br J Surg. 1996 Sep. 83(9):1248-51. [Medline]. Barone JE, Burns G, Svehlak SA. Management of blunt splenic trauma in patients older than 55 years. Southern Connecticut Regional Trauma Quality Assurance Committee. J Trauma. 1999 Jan. 46(1):87-90. [Medline]. Bianchi JD, Collin GR. Management of splenic trauma at a rural, Level I trauma center. Am Surg. 1997 Jun. 63(6):490-5. [Medline]. Caplan ES, Boltansky H, Snyder MJ. Response of traumatized splenectomized patients to immediate vaccination with polyvalent pneumococcal vaccine. J Trauma. 1983 Sep. 23(9):801-5. [Medline]. Cathey KL, Brady WJ Jr, Butler K. Blunt splenic trauma: characteristics of patients requiring urgent laparotomy. Am Surg. 1998 May. 64(5):450-4. [Medline]. Clancy TV, Ramshaw DG, Maxwell JG. Management outcomes in splenic injury: a statewide trauma center review. Ann Surg. 1997 Jul. 226(1):17-24. [Medline]. Clancy TV, Weintritt DC, Ramshaw DG. 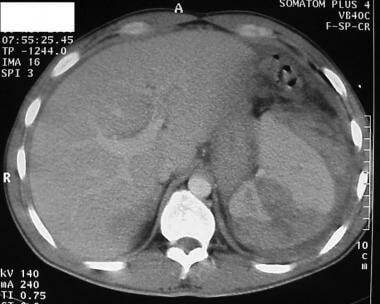 Splenic salvage in adults at a level II community hospital trauma center. Am Surg. 1996 Dec. 62(12):1045-9. [Medline]. Coburn MC, Pfeifer J, DeLuca FG. Nonoperative management of splenic and hepatic trauma in the multiply injured pediatric and adolescent patient. Arch Surg. 1995 Mar. 130(3):332-8. [Medline]. Cocanour CS, Moore FA, Ware DN. Age should not be a consideration for nonoperative management of blunt splenic injury. J Trauma. 2000 Apr. 48(4):606-10; discussion 610-2. [Medline]. Cocanour CS, Moore FA, Ware DN. Delayed complications of nonoperative management of blunt adult splenic trauma. Arch Surg. 1998 Jun. 133(6):619-24; discussion 624-5. [Medline]. Cochran A, Mann NC, Dean JM. Resource utilization and its management in splenic trauma. Am J Surg. 2004 Jun. 187(6):713-9. Cohn SM, Arango JI, Myers JG, Lopez PP, Jonas RB, Waite LL, et al. Computed tomography grading systems poorly predict the need for intervention after spleen and liver injuries. Am Surg. 2009 Feb. 75(2):133-9. [Medline]. Daoud RA, Taghizadeh AK, Pickford RB. Conservative management of splenic trauma. J R Army Med Corps. 1999 Jun. 145(2):69-72. [Medline]. Ekeh AP, Izu B, Ryan M, McCarthy MC. The impact of splenic artery embolization on the management of splenic trauma: an 8-year review. Am J Surg. 2009 Mar. 197(3):337-41. [Medline]. Garber BG, Yelle JD, Fairfull-Smith R. Management of splenic injuries in a Canadian trauma centre. Can J Surg. 1996 Dec. 39(6):474-80. [Medline]. Gaunt WT, McCarthy MC, Lambert CS. Traditional criteria for observation of splenic trauma should be challenged. Am Surg. 1999 Jul. 65(7):689-91; discussion 691-2. [Medline]. Guth AA, Pachter HL, Jacobowitz GR. Rupture of the pathologic spleen: is there a role for nonoperative therapy?. J Trauma. 1996 Aug. 41(2):214-8. [Medline]. Harbrecht BG, Peitzman AB, Rivera L, et al. Contribution of age and gender to outcome of blunt splenic injury in adults: multicenter study of the eastern association for the surgery of trauma. J Trauma. 2001 Nov. 51(5):887-95. Harbrecht BG, Zenati MS, Alarcon LH. Is outcome after blunt splenic injury in adults better in high-volume trauma centers?. Am Surg. 2005 Nov. 71(11):942-8; discussion 948-9. Ivatury RR, Simon RJ, Guignard J. The spleen at risk after penetrating trauma. J Trauma. 1993 Sep. 35(3):409-14. [Medline]. Keller MS, Vane DW. Management of pediatric blunt splenic injury: comparison of pediatric and adult trauma surgeons. J Pediatr Surg. 1995 Feb. 30(2):221-4; discussion 224-5. [Medline]. Kilic N, Gurpinar A, Kiristioglu I. Ruptured spleen due to blunt trauma in children: analysis of blood transfusion requirements. Eur J Emerg Med. 1999 Jun. 6(2):135-9. [Medline]. Krause KR, Howells GA, Bair HA. Nonoperative management of blunt splenic injury in adults 55 years and older: a twenty-year experience. Am Surg. 2000 Jul. 66(7):636-40. [Medline]. Krupnick AS, Teitelbaum DH, Geiger JD. Use of abdominal ultrasonography to assess pediatric splenic trauma. Potential pitfalls in the diagnosis. Ann Surg. 1997 Apr. 225(4):408-14. [Medline]. Lawson DE, Jacobson JA, Spizarny DL. 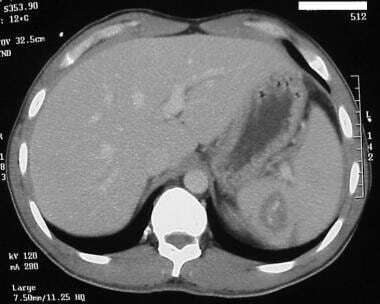 Splenic trauma: value of follow-up CT. Radiology. 1995 Jan. 194(1):97-100. [Medline]. Lucas CE. Splenic trauma. Choice of management. Ann Surg. 1991 Feb. 213(2):98-112. [Medline]. Morrell DG, Chang FC, Helmer SD. Changing trends in the management of splenic injury. Am J Surg. 1995 Dec. 170(6):686-9; discussion 690. [Medline]. Myers JG, Dent DL, Stewart RM. Blunt splenic injuries: dedicated trauma surgeons can achieve a high rate of nonoperative success in patients of all ages. J Trauma. 2000 May. 48(5):801-5; discussion 805-6. [Medline]. Novelline RA, Rhea JT, Bell T. Helical CT of abdominal trauma. Radiol Clin North Am. 1999 May. 37(3):591-612, vi-vii. [Medline]. Pachter HL, Guth AA, Hofstetter SR. Changing patterns in the management of splenic trauma: the impact of nonoperative management. Ann Surg. 1998 May. 227(5):708-17; discussion 717-9. [Medline]. Peitzman AB, Heil B, Rivera L. Blunt splenic injury in adults: Multi-institutional Study of the Eastern Association for the Surgery of Trauma. J Trauma. 2000 Aug. 49(2):177-87; discussion 187-9. [Medline]. Pisters PW, Pachter HL. Autologous splenic transplantation for splenic trauma. Ann Surg. 1994 Mar. 219(3):225-35. [Medline]. Poulin EC, Thibault C, DesCoteaux JG. Partial laparoscopic splenectomy for trauma: technique and case report. Surg Laparosc Endosc. 1995 Aug. 5(4):306-10. [Medline]. Ransom KJ, Kavic MS. Laparoscopic splenectomy for blunt trauma: a safe operation following embolization. Surg Endosc. 2009 Feb. 23(2):352-5. [Medline]. Rappaport WD, McIntyre KE, Stanton C. The effect of alcohol in isolated blunt splenic trauma. J Trauma. 1990 Dec. 30(12):1518-20. [Medline]. Rose AT, Newman MI, Debelak J. The incidence of splenectomy is decreasing: lessons learned from trauma experience. Am Surg. 2000 May. 66(5):481-6. [Medline]. Rutherford EJ, Livengood J, Higginbotham M. Efficacy and safety of pneumococcal revaccination after splenectomy for trauma. J Trauma. 1995 Sep. 39(3):448-52. [Medline]. Rutledge R, Hunt JP, Lentz CW. A statewide, population-based time-series analysis of the increasing frequency of nonoperative management of abdominal solid organ injury. Ann Surg. 1995 Sep. 222(3):311-22; discussion 322-6. [Medline]. Schurr MJ, Fabian TC, Gavant M. Management of blunt splenic trauma: computed tomographic contrast blush predicts failure of nonoperative management. J Trauma. 1995 Sep. 39(3):507-12; discussion 512-3. [Medline]. Shatz DV. Vaccination practices among North American trauma surgeons in splenectomy for trauma. J Trauma. 2002 Nov. 53(5):950-6. [Medline]. Smith J, Armen S, Cook CH, Martin LC. Blunt splenic injuries: have we watched long enough?. J Trauma. 2008 Mar. 64(3):656-63; discussion 663-5. [Medline]. Wasvary H, Howells G, Villalba M. Nonoperative management of adult blunt splenic trauma: a 15-year experience. Am Surg. 1997 Aug. 63(8):694-9. [Medline]. Williams RA, Black JJ, Sinow RM. Computed tomography-assisted management of splenic trauma. Am J Surg. 1997 Sep. 174(3):276-9. [Medline]. Hemisplenectomy (splenorrhaphy) with preservation of greater than 50% of splenic parenchyma. Physical findings in postsplenectomy sepsis with peripheral thrombosis and disseminated intravascular coagulation (DIC). 30-Hour Shifts for Residents Just as Safe?